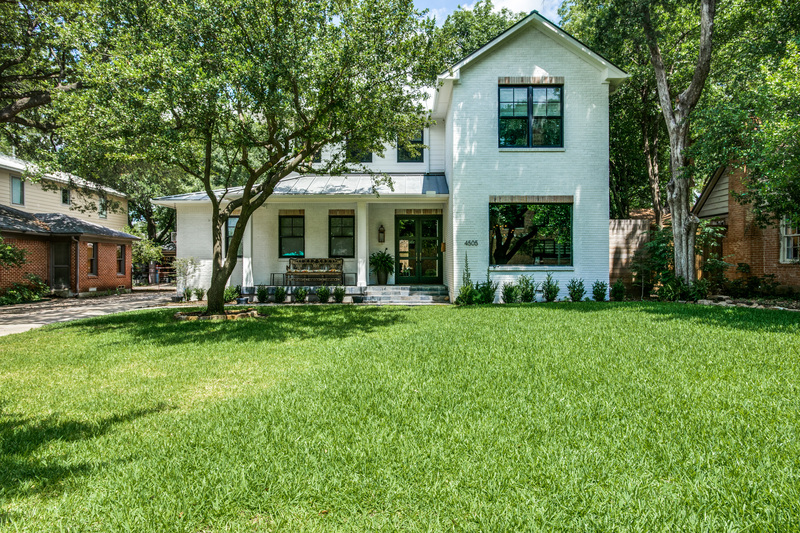 Situated in the Park Cities Vicinity in coveted Bluffview, 4505 Pomona Road is a fabulous clean lined transitional farmhouse residence nestled on an expansive 62’ x 240’ deep lot and was completely rebuilt and expanded from top to bottom to perfection in 2016. Details include an open floor plan with 10-foot ceilings downstairs, spacious entertaining rooms, gleaming hardwoods, deep molding, designer lighting and window treatments, sound system speakers, and gorgeous marble and quartz finishes throughout. The sophisticated two-story home offers approximately 3,274 square feet, four bedrooms, 4.1 baths, an inviting front foyer, chic formal dining room, intimate study with built-ins, chef’s white marble Danby kitchen with premier stainless appliances, including Bertazzoni, Electrolux, Scotsman and U-Line, an expansive breakfast bar, large walk-in pantry and also opens to an oversized family room with a floor-to-ceiling brick fireplace surround and double French doors opening to the terrace, powder room with a gorgeous onyx floating vanity, spacious upstairs den or game room with adjacent office nook area, luxurious downstairs master suite with built-ins and a gorgeous quartz and marble bath with glass-tiled accents, His and Hers vanities, a soaking tub, separate double shower and a huge walk-in closet, three additional generous-sized second floor bedrooms with large closets and are served by three elegant marble or quartz baths, and a fully equipped utility room with white marble Danby counters and a mosaic-tiled backsplash and flooring. Outside, the backyard grounds set the tone for a sophisticated atmosphere for entertaining. Marked by columns with stylish drapery, the spacious covered terrace conveniently features an outdoor brick fireplace, ceiling fans, sound system speakers and also overlooks the expansive landscaped backyard grounds. A two-car detached garage plus a generous-sized office completes this stunning residence.